I love a beautiful powder room. Don't you? Although the space is typically very minimal, there are endless options for styling it well. A powder room is a great area to wallpaper. Bold patterned wallpaper adds drama and compensates for a lack of furniture or space. 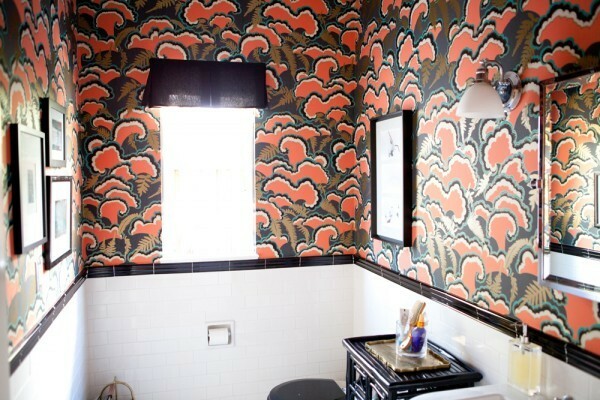 Plus, you won't tire of the wallpaper since the powder room is rarely used, except by guests. Another way to add style to a guest bathroom is to decorate it as you would any other room- add a throw rug, hang a piece of art, or even add a fun ottoman! Finally, add a little touch of style to your powder bath by adding fresh cut flowers and bathroom essentials in pretty jars. How do you style your powder room? What's inspiring you this Monday morning? I think this is one of the most important rooms to decorate well! No one wants to get ready in an ugly bathroom. I'd love your opinion on it sometime! 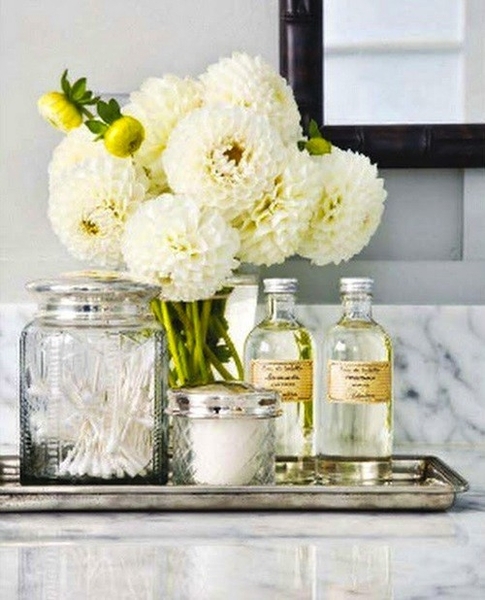 I really love a vanity tray with fresh flowers & shiny votives. It's the perfect feminine touch. I love the black and white photos in the first room. And I think all my rooms officially need fresh flowers : ) I must make this happen! I love these bathrooms! You're so right about the wallpaper. A pink door in the house- so fun and different! gorgeous! gorgeous! Every girl deserves a well-styled one! Oooh I've often thought of doing a gallery wall in our powder room, but really, the wallpaper is what makes these rooms! IF I had a half bath in this hole in the wall apartment, I would most definitely use wallpaper... you're spot on about it being a great place to show off some amazing accessories, art, & wallpaper! 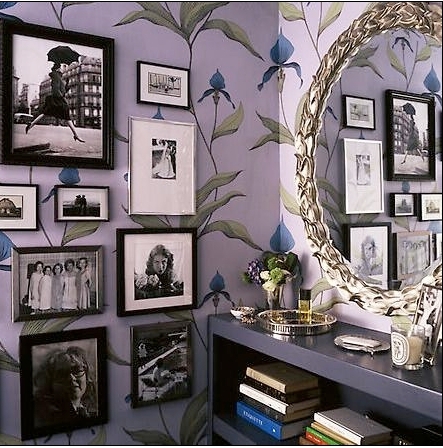 I'd probably use an Amy Butler rug w/ some great collage of photos like shown in that first powder room. Then I'd probably (depending on what kind of counter is in there) sport the great invention of a counter "skirt"... easy to make & great for hiding goodies behind it (aka toilet paper, feminine products, towels, etc.) I think powder rooms are one of the most fun rooms in a home... you can have fun with it without it being too much in an entire room of your house! :) Happy Monday! Beautiful photos! I love love love the all pink bathroom with the "Keep calm" poster, very pretty and refreshing! You always have the prettiest pictures! I love the idea of adding a patterned wallpaper, I can't wait till we're not renting anymore so we can add it to a powder room! I always have fresh flowers, though. It adds so much! Decorating our powder room/guest bath is one of my favorite things to work on! Beautiful picks, I am especially in love with that pink tufted ottoman, gorgeous! Feeling very inspired by that black and white subway tile! Great inspiration. Love the glamor in all your picks. I love wallpaper in the bath! We had it in our last house, but we are renting here, so I cant do anything with it. I cant wait to own again! Kind of the same idea as wallpaper...I painted my powder room a cranberry red color. It was the perfect place to do it, because as you said, it's rarely used, so I don't get tired of it. Love wallpaper in a powder room! So gorgeous!!! 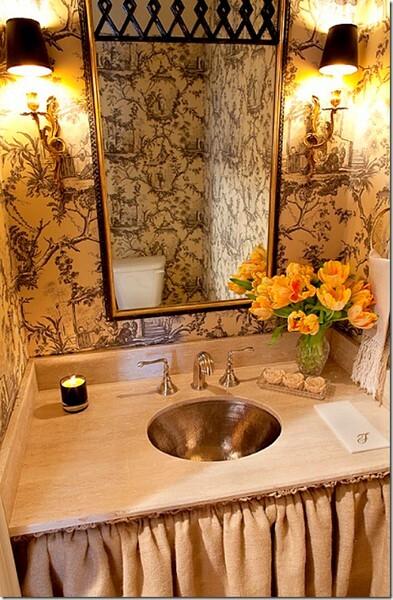 and I love these styled powder rooms! makes getting ready way more fun ;) I think i'd def add some fun wallpaper once we're out of apartment living! I think it's the perfect room to be a little more daring with a wallpaper choice...love these gorgeous images!! Very true, a powder room is a great space to try out a bold wallpaper! These are all so cute, i can't decide which is my favorite. Love the vintage wallpaper patterns in these! I love a nice styled powder room! Love the vintage looks, especially in the third photo! I have that pink keep calm and carry on poster in my eating nook. I suppose I could spruce up my powder room, though. Girlie and gorgeous. I can spend hours there. oh my gosh, #1 & #3 are my definite faves!! and I love the display trays!! I need some for my bathroom!! 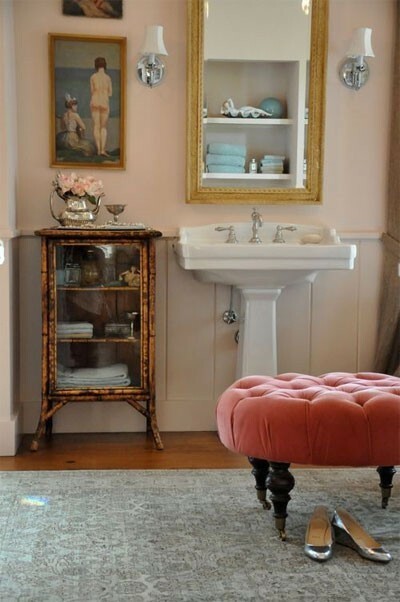 I'm so with you, adore a well styled powder room as well. A great space to have fun with decor and "go for it"! Oh, that bold wallpaper is perfection! Thanks for the beautiful inspiration! I don't suppose you know the name of that beautiful wallpaper in pic 1 - of iris on lilac background?